Isn’t Clicker Training for Dogs? / Isn’t Clicker Training for Dogs? I’ve been asked this question more times than I can count in the last couple of weeks. I have researched clicker training for horses on and off for about a year. There are a couple individuals that I’ve followed on social media, read all of their information, watched some of their videos, etc. However, I never took the time to officially try it. Well, I purchased a young mustang about 4 months ago who has all but forced me to buy a clicker and buckle up for the ride. First of all, for those who haven’t met him yet, let me introduce you to Friday. Friday is a 3.5 year old blue roan mustang gelding. I was told that he was orphaned at a couple of months old, so he was never taken to the holding pens. He was taken to a sanctuary, and adopted out as soon as he was weaned. The individual that adopted him from the sanctuary sold him 6 months to a year later to the woman I bought him from. Friday came along tremendously at first. Within a month he was free lounging confidently, leading well, soft tying, I could pick out all of his feet, etc. However, the first visit by my trimmer was a disaster. I felt that Friday was well prepared and ready. Yet, as soon as Friday saw the trimmer, he wouldn’t let me catch him. When I did catch him he wouldn’t let the trimmer touch him. When the trimmer did touch him, he’d jump out of his skin. Puzzling to say the least. What was immensely frustrating is after the trimmer visited, Friday went into a downward spiral for nearly a month. I could no longer soft tie him, I couldn’t pick up his feet, and he was significantly spookier. It was obvious that I had lost his trust, but I wasn’t sure why as he’d has his feet done on a regular schedule by his previous owner. My best guess was that he wasn’t prepared to be around a man. So, had some male family friends around. He was slightly suspicious of them, but nothing like the trimmer. Still baffled. I reached out and found a trimmer locally that enjoys introducing horses to being trimmed and has a lot of experience with mustangs. Perfect. She did wonderfully with him and can now get his feet done with some time. So, immediate urgency resolved as he can get his feet done, but it still didn’t seem to be resolving the root issue. Quite randomly I was contacted by the seller. I let her know how both ponies were doing and included updates on Friday and the trimmer. She let me know that they had always twitched him to have his feet done. And that explained everything to me. I am not writing this to publicly criticize the seller, the seller’s trimmer, or anyone else. I believe that the majority of people do the best they know how. As an advocate for better treatment of horses, I certainly wish that more people knew better, but criticizing them will not better the lives of horses, only educating can. Armed with my new knowledge and level of understanding of Friday’s world, I worked with my usual traditional method of ground, desensitizing and confidence building to work towards picking up his feet. These did not help Friday. For a week I had been unable to pick up Friday’s right hind foot because when I was picking it up one day, he shifted his feet to balance himself better, suddenly panicked because he thought a yank on the twitch was coming so pulled away. Frustrating to say the least. So, my mind returned to clicker training. Friday’s challenge was that he already had significant stress and probably pain associated with picking up his feet. His fear was beyond clearly explaining to him that it wasn’t going to hurt because, in his experience, it always had! I needed to help him build positive memories of picking up his feet. Clicker training seemed like the best way to do that. I bought a clicker. Within one 15 minute session the next day with the clicker and a pouch full of oat-alfalfa pellets, I was able to pick up and pick out his right hind foot. For the last couple of weeks, I have been able to pick up and pick out all of his feet. He still gets scared occasionally, and we are able to work through the fear within 5 minutes when that used to take us a week or more. Only time will tell if we’ll be able to completely eradicate the fear, but it is a start. So why does clicker training work? The idea behind the clicker is that the horse associates the click with food or a treat. As they become practiced with the clicker, they learn to associate the thought they’re having and movement they’re doing when they hear the click as the desired response to your question. Therefore, it is much clearer to the horse what the desired thought and movement was. When handling a horse without a clicker, the horse will often have already moved onto another thought before a release occurs. A clicker, because it is so quick, can pin point thoughts and behaviors with more accuracy. Furthermore, food keeps many horses more engaged. It gives them a reason to focus, they want that food! In general, I have been against using food and treats for training and am a very occasional treat giver, but I cannot argue with the success the clicker training has had with Friday. I doubt that I will use clicker training for absolutely everything. However, my experience with Friday has shown me that clicker training is a wonderful tool for helping horses to work through areas that have previously caused stress and/or trauma because the treats/food can help create positive memories more quickly. For example, I plan to use clicker training with one of my very experienced horses that has a tendency to be defensive about grooming and tacking up from years of being groomed the same as every other horse despite the fact that he’s a very sensitive horse. He’s gotten better, especially in the last year and a half as I’ve been the one grooming him the vast majority of the time, but there’s still stress lurking beneath the surface. 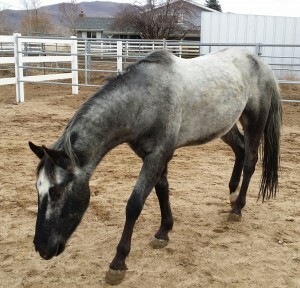 There are certain horse personality types, such as Friday, that I’m sure I will use clicker training more often with when introducing new things because it encourages that type of horse to keep trying and building their confidence, rather than becoming afraid and retreating mentally and emotionally. I would love to hear about your thoughts on clicker training. Have you tried it? Did you feel it was successful?